Jacksonville, Fla. – Award-winning Interior Designer Marsha Faulkner of Studio M Interior Design launches her online presence today in the exclusive high-end luxury marketplace DeringHall.com. Faulkner will be featured as an Interior Designer along side nationally recognized designers Steven Gambrel, Francis Sultana, Carrier & Company, Richard Mishaan, Kara Mann, Marytn Lawrence Bullard and others. Marsha Faulkner is a Registered Interior Designer in the state of Florida and a LEED Accredited Professional. She is currently serving on multiple Interior Design and Architectural Councils and has been a past leader in the American Society of Interior Designers on the local and national level for years. Marsha practices as a professional designer. She has also served as an Adjunct Professor of Interior Design at Florida State College Jacksonville. She has been involved on numerous award-winning commercial and residential projects. 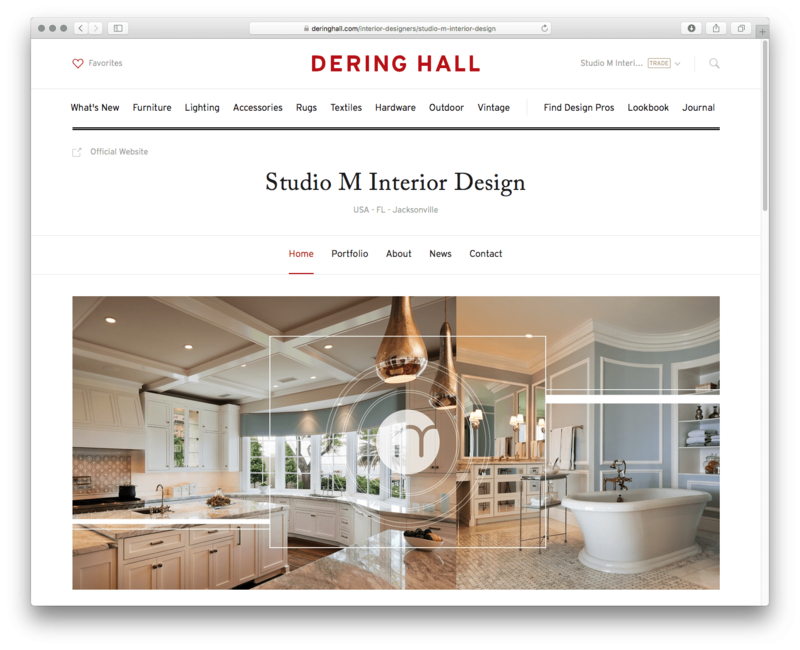 Dering Hall is an online marketplace for the finest interior designers, architects, artisans, and design galleries to showcase their work and sell new, high-end home furnishings and accessories. Dering Hall is passionate about design and broadening the audience for the best the industry has to offer. The ongoing mission is to assemble a community of the world’s leading creators in one place and to connect them with other designers and savvy, sophisticated consumers. Dering Hall provides a roster of top talent with permanent storefronts, where they present a curated assortment of products to highly engaged shoppers. These customers, in turn, gain access to unique pieces previously available only to select designer clients. It’s an entirely new approach to furnishing a home—and one that makes hunting for that perfect bespoke sideboard a dynamic and enjoyable experience. Both Studio M Interior Design and Dering Hall are truly excited to bring this new and progressive way of expanding the interior design craft and selection to the Jacksonville market. It is definitely a growth opportunity for every aspect.